In the seventies, before I had my first cabinet shop, I worked as a documentary film-maker and cameraman. That interest prompted the construction of this bunk and projection booth built-in in my small bungalow in Laurel Canyon. The walnut panels were found at a salvage yard I knew about called Scavenger’s Paradise, (I think I paid $2 per panel). 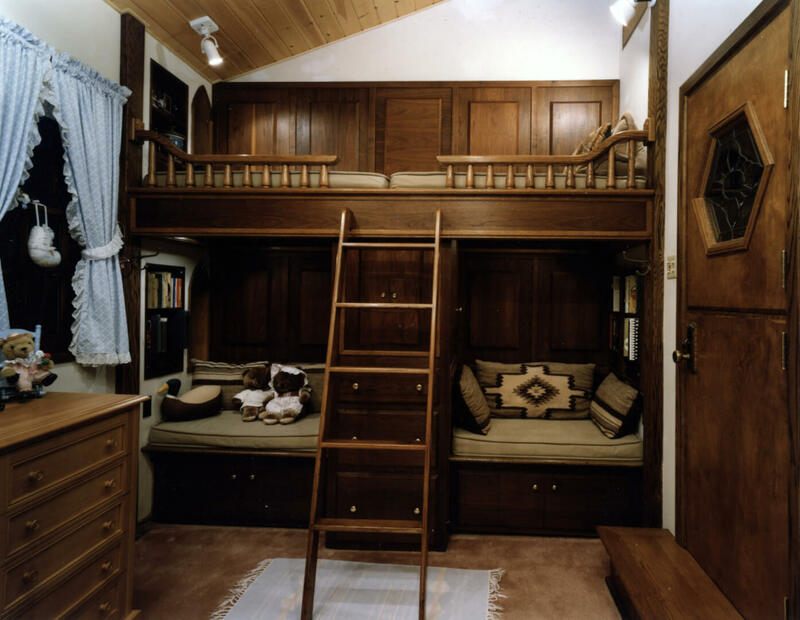 The bunk and railing were inspired by some photos I’d seen of a sailing ship interior. A 16 millimeter projector sat inside the sound-proofed cabinet (behind the ladder), where two exhaust fans kept the projector cool by porting the hot air up through the back wall to a vent on the roof. At the time of this photo (circa 1986), the room had been re-dedicated as my first daughter’s bedroom (hence the blue curtains, rug and teddy bears). The project proved to be a great learning experience that included a wide range of woodworking challenges. I worked on it, whenever there was time, for the better part of three years. It was difficult to leave behind when I sold the house in 1990.